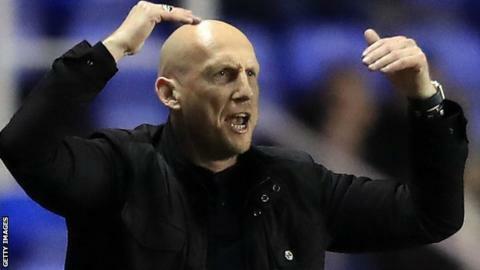 Manager Jaap Stam said his "risk-taking" triple substitution against Brentford paid off as Reading kept pressure on the Championship's top two. Two goals in four minutes for the Royals turned a 2-1 deficit into a 3-2 victory against the Bees on Tuesday. Two of the three substitutes - winger Roy Beerens and forward Yann Kermorgant - combined for the winner. "It was a great game to watch, but I think for both managers quite tense," Stam told BBC Radio Berkshire. Reading extended their unbeaten run to six games and closed the gap on second-placed Brighton to five points with the victory. Stam confessed his decision to bring on Beerens, Kermorgant and midfielder George Evans with 17 minutes to go proved the value and togetherness of his squad. "Sometimes you need to take certain risks," the Dutchman said. "The players that came on earned it very well and that's what they need to do. "Sometimes we make choices on who's going to be playing, looking at the opposition and the fitness of the players. "The players are sometimes not too happy when they're not playing, but that's part of being a team and a process. "If you want to achieve certain things, then you need to be a professional and do your job and that's what the players have done."